"In 1959, Walt Disney Productions began looking for land for a second park to supplement Disneyland, which opened in Anaheim, California, in 1955. Market surveys revealed that only 5% of Disneyland's visitors came from east of the Mississippi River, where 75 percent of the population of the United States lived. He flew over the Orlando site (one of many) in November 1963. 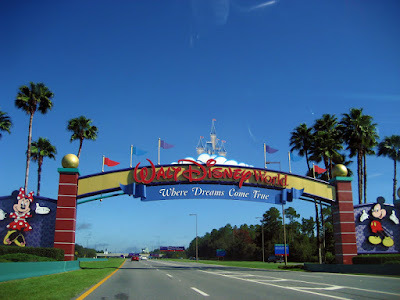 Seeing the well-developed network of roads, Disney selected a centrally-located site near Bay Lake, and used various dummy corporations to acquire 27,443 acres of land. 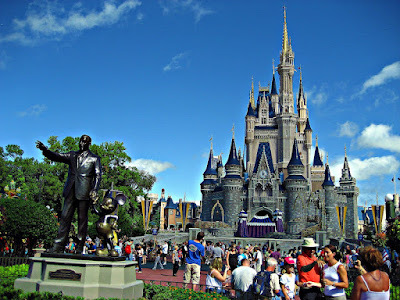 "Walt Disney died from lung cancer on December 15, 1966, before his vision was realized, so his brother and business partner Roy took over, and dedicated it on October 1, 1971 with only the Magic Kingdom theme park, declaring it as "Walt Disney World" in his brother's honor. In his own words: "Walt Disney World is in memory of the man who started it all, so people will know his name as long as Walt Disney World is here." Gate 1, Are We There Yet? "It has often been said that the true essence of Disney magic can be experienced simply by stepping foot inside the Magic Kingdom. 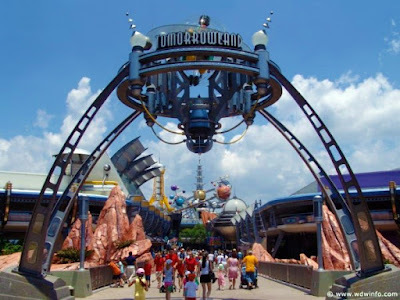 The venerable theme park has withstood more than three decades of changing cultures, a constantly shifting social climate, and an explosion of technology that has left lesser places outdated and obsolete. Yet, somehow, the Magic Kingdom continues to remain the undisputed king of theme parks, drawing more yearly visitors than any other. Gate 2, Are We There Yet?! 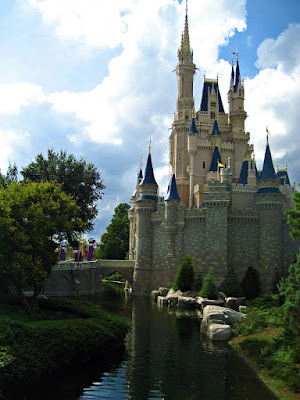 "How the Magic Kingdom has managed to maintain its charm and appeal over the years is a lesson in simplicity. It has stayed true to its original vision, a place where families could gather in a clean and safe environment to enjoy the time they spend together. 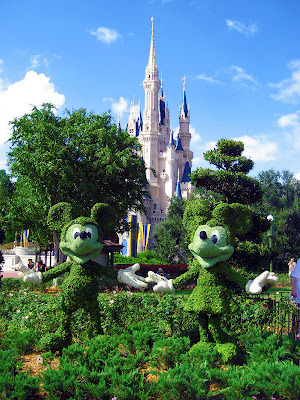 No trip to Disney World is complete without visiting the Magic Kingdom. 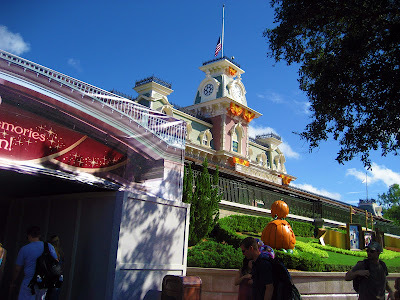 For veteran visitors to Walt Disney World, visiting the Magic Kingdom is like visiting an old friend. To first time visitors, they find themselves quickly, and almost helplessly, transported back to their childhood. Finally Past the Admission Gate and Getting Somewhere, Hooray! 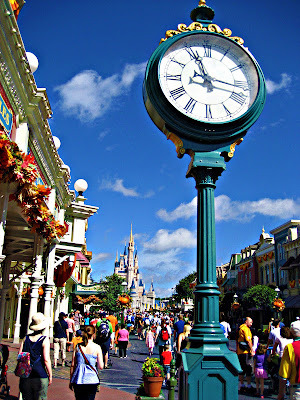 "Designed like a wheel with the hub in front of Cinderella Castle, pathways spoke out across the 107 acres of the Magic Kingdom, leading to these 6 whimsical lands: Main Street, U.S.A., Adventureland, Frontierland, Liberty Square, Fantasyland, and Tomorrowland; each themed to its appropriate title. A vast network of underground tunnels connect all sections of the Magic Kingdom, thus preventing guests from seeing any of the necessary "behind the scenes" operations, and preventing cast members from one land from having to walk through another. 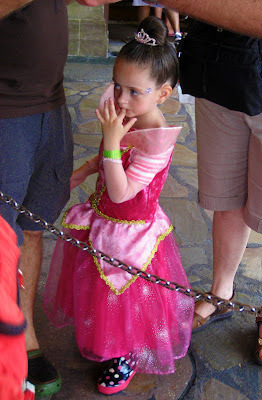 Well, that was the original idea anyway - recent changes to park policy now allow cast members to walk freely through the park in whatever outfit they happen to be wearing. 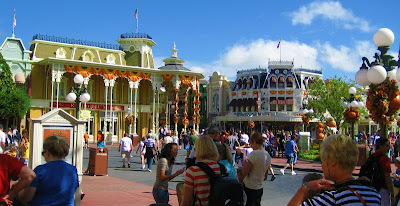 Shops of Main Street, U.S.A.
"Most spectacular of all Disney parks are the parades and fireworks displayed at the Magic Kingdom in Orlando. Most notably, the current combo of the "Wishes" fireworks show, and the perennial nighttime favorite, Spectromagic. If these two performances don't impress you, then you're already dead and no one's bothered to tell you. 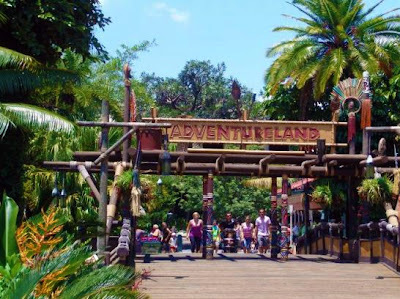 "From a touring perspective, "The Most Magical Place on Earth" can present some real challenges for those who want to experience the "magic" and not wait 90 minutes on each attraction to do so. As most visitors have learned, sometimes unfortunately, a good plan is probably the single most important tool you can use to get the most from your visit." [wdwinfo.com] Or, if you have to do things on the fly like me, take advantage of single rider lines, Fastpass, and if possible, avoid weekends and off-peak months. 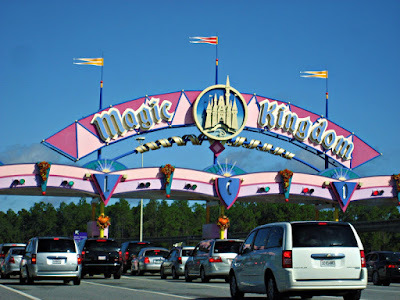 I drove under the Magic Kingdom gateway arch at 10:45am, paid the exorbitant $14 parking fee, followed the directions of park staff to the designated parking space, and arrived at the ticketing booths. I had already purchased my 4-day admission pass at AAA for $239, saving a whopping 4 whole dollars off regular price, lol, so I was able to save some time by avoiding that line and proceeded to the entrance gate where they scanned my pass and handed me a map, then from the tunnel under the railroad I emerged into Main Street, U.S.A.
Main Street, U.S.A allows you to step back into early-20th century small-town America, inspired by Walt Disney's childhood and the film Lady and the Tramp, and it represents the park's "opening credits," acknowledging those people who were influential at Walt Disney World or other Disney parks, by bearing their names on the windows of the numerous shops selling food and merchandise. The park was largely decorated for Halloween, a favorable contrast to the marvelous spectacle of Christmas I was fortunate to witness on my last trip to Disneyland. 3 Million Gallons of Water! City Hall contains the Guest Relations lobby, where cast members provide information, assistance, and more importantly in my case - FREE souvenir pins! =D Shops include a working barber shop, a confectionery, bakery, ice cream parlor, and Town Square Theater. 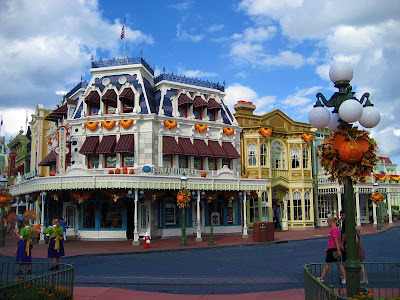 Here, life bustles with all the accoutrements of yesteryear including horse drawn trolleys, horseless carriages, the Walt Disney World Railroad Station, and other main street vehicles. 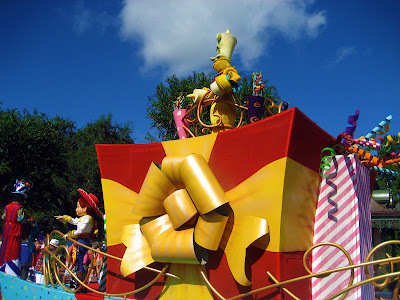 Upon reaching the end of Main Street, I found myself in the middle of the "Celebrate A Dream Come True Parade," featuring a collection of classic Disney moments with music, floats and favorite Disney characters. Then I took a moment to appreciate Cinderella Castle, a medieval castle rising 190 feet into the sky (more than 100 feet taller than Sleeping Beauty Castle in Disneyland), complete with 27 towers, soaring spires, ornate turrets and a shimmering moat containing 3.37 million gallons of water! Major elements of the Castle were scaled and angled to give the illusion of distance and height, an optical trick known as forced perspective to make the Castle appear larger than it actually is, a method frequently used in Disney theme parks around the world. As I walked over the bridge into Liberty Square, a more low-key area of the park, I stepped into a recreation of an American Revolutionary colonial town, with brick covered buildings reminiscent of Williamsburg, Virginia. 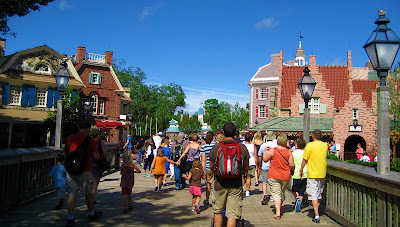 Notable elements include a replica of the Liberty Bell, the patriotic Hall of Presidents attraction, and the Liberty Belle - and authentic 3-tiered paddle-wheel steamship that circles Tom Sawyer Island. Of course, no visit to Liberty Square is complete without experiencing The Haunted Mansion attraction; one of the best rides in the whole park. It happened to be temporarily closed, but I made sure to return before the park closed. 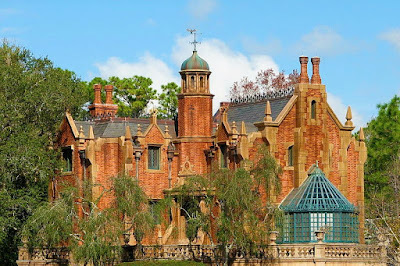 "The Haunted Mansion is a spooky dark ride tour of an ominous 18th-century haunted mansion, where aboard a "Doom Buggy" your Ghost Host takes you through several dusty rooms, where you can see eerie signs of ethereal awakening. Soon, you encounter the mansion's resident medium, Madame Leota, who invokes the mansion's ghost and ghouls to show themselves. What follows has to be seen to not be believed, but suffice to say that you've never before seen the dead so lively. The conclusion is definitely more merry than scary, but the sight of wraiths and skeletons—even of the kindest constitution—is something you're sure to remember as long as you live." 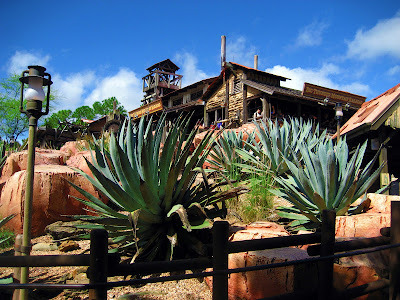 I then entered Frontierland, where the strums of banjo music and the smell of smoked turkey legs and it will lead you to the old-time wild west, characterized by clapboard buildings and gingham and denim clad cast members, and landscaping adorned with mesquite trees, century plants, evergreens, slack pines and fragrant, flowering Jerusalem thorns. Big Thunder Mountain Railroad (a fairly mild indoor/outdoor mine train roller coaster with sharp turns and drops) was closed (that's two rides in a row! 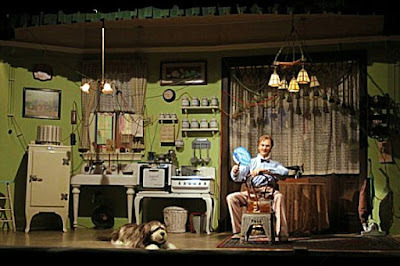 ), but I wasn't too bummed, since I've been on the original version at Disneyland. I think I also didn't get to go on Splash Mountain (a popular flume ride with twists, turns and 3 dips that lead to the grand drop down 5 stories of rushing water), which if memory serves me correctly, was also closed. At this point I was frustrated. 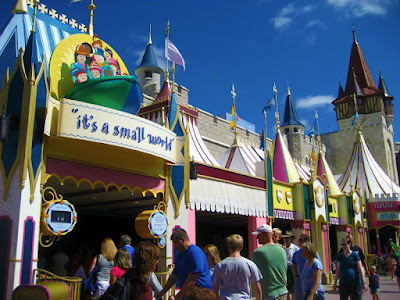 Next, I explored Fantasyland, a carnival-style Bavarian village, with child-friendly dark rides of storybook classics like Peter Pan, Dumbo, Snow White, and Winnie the Pooh. As I did several times at Disneyland, I rode it's a small world, a 7-minute (less than half the length of the one in Disneyland) gentle boat ride through different depictions of cultures of the world, with nearly 300 brightly audio-animatronic dolls in the style of children representing more than 100 nations, that sing and dance to its title song in 5 languages. I threw on my "opera glasses" and kicked back to Mickey's PhilharMagic, a dazzling and innovative 12-minute 4-D movie, where Mickey Mouse and Donald Duck sweep you into the scenes from classic Disney films as Donald chases the Sorcerer's hat that starts all the trouble! The film features 3-D effects, scents, and water, and is projected on the largest purpose-built 3D screen in the world, at 150 feet wide! Disney is silly. 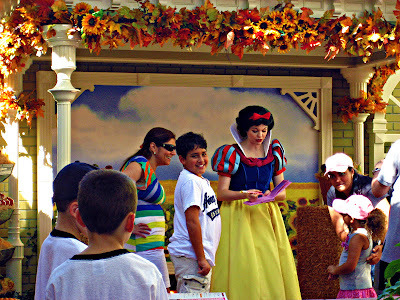 After years of being named "Snow White's Adventures," they removed some of the scary witch popping out so much and added the character of Snow White in an effort to tone down the scare factor, then ADDED "Scary" into the ride's title, LOL! 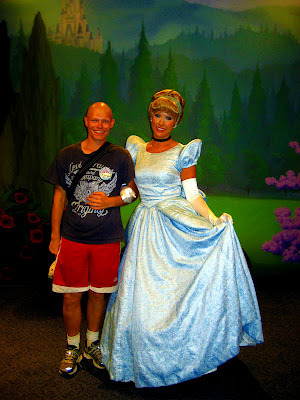 Nevertheless, I boarded the 6-passenger mine car of Snow White's Scary Adventures, traveled through the dark, spooky woods to find the Dwarf's and their cottage, the witch got what was coming to her, and in the end Snow White's prince saved the day. The ride's relatively low tech and there's rarely a wait, but it's closing May 31, 2012, which is kind of sad, since it is one of the few remaining attractions that was operational on Disneyland's opening day in 1955. I didn't even have to show my driver's license to experience the glory of the famous Indianapolis Motor Speedway on the Tomorrowland Speedway ride, where I hopped into my own little Indy 500-style race car and drove around a 4-laned, 2000-foot guided steel track, complete with the "sounds of racing" played over the PA, photos, images and other racing icons; there's even a covered observation bridge where spectators watched the race from the stands. World famous announcer Tom Carnegie called the race as the cars made their way around the track to the Victory Circle, at death defying speeds of up to 7 miles per hour, LOL! 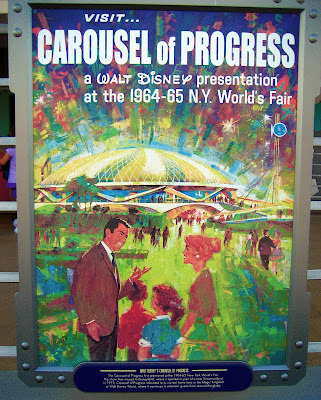 Much like the theme of the attraction itself, the Carousel of Progress has had quite a journey. 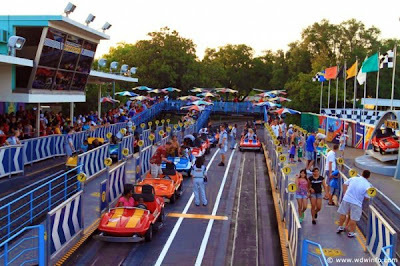 Originally created by Walt Disney himself for the 1964 World’s Fair, it became a big hit when it was placed inside Disneyland in 1967, then moved here six years later. Guests seated inside of the 250 seat theater are treated to a 21-minute story of the advances in technology during the twentieth century, as the audience revolves around the set of six different scenes depicting different eras of an [animatronic] American family’s life, beginning in the early 1900’s to the turn of the 21st century. 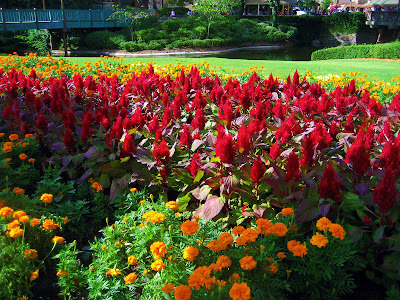 What some see as "Walt's legacy," others see as a dated attraction that's only open during the busier times of year, but Walt Disney World claims that this show has been seen by more people than any other theater show in the history of America, and if it's open, you can be assured of two things: the park is probably busy and there's very little wait for this attraction. It can be a very pleasant way to pass 20 minutes, comfortably seated in a theater away from the crowds and out of the heat, and best of all you're watching a show that Walt himself designed. With a wait time of less than 5 minutes, I entered Stitch's Great Escape!, a multi-sensory experience featuring audio, video and animatronic technology in a theater-in-the-round venue, which details events occurring before the film “Lilo & Stitch," starting with the premise that you're a new security recruit for the Galactic Federation, responsible for transporting criminals via a new teleportation device. It features the turmoil caused by the escape of “Experiment 626” (aka Stitch), when he was first discovered and captured. 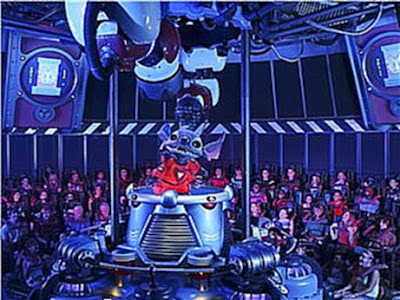 The attraction engages sight, sound, touch and smell, as Stitch wreaks havoc - spitting, bouncing on your shoulders, and belching on your neck with hot breath and smell of a chili dog he steals from a guest. It goes from tame and boring to fairly wild and scary for some, though for me it left something to be desired. Seated inside Monsters, Inc. 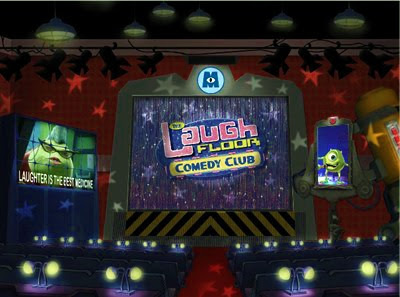 Laugh Floor, I watched "Monster of Ceremonies" Mike Wazowski crack corny jokes at the audience's expense to fill a laugh meter that generates power for the monster world of Monstropolis, in a partly improvised, interactive comedy show using digital puppetry technology in a 400-seat theater. While waiting for the show to begin, you can text message your own jokes as suggestions. The show definitely skews toward a younger crowd, with good-natured gags and puns. 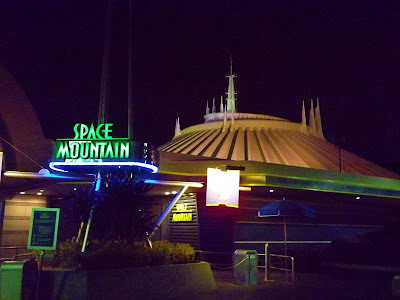 I boarded a sleek, rocket-shaped vehicle in the glow-in-the-dark Space Port and began a steady climb up the 180-foot high Space Mountain, passing the Mission Control booth and myriad pulsating lights along the way. Once at the top, you feel the wind race across your face as you're propelled on a rip-roaring ride through the blackest reaches of time and space—illuminated only by shooting stars, celestial satellites, spinning black holes and shimmering constellations, never fully knowing when you're going to drop or swerve! 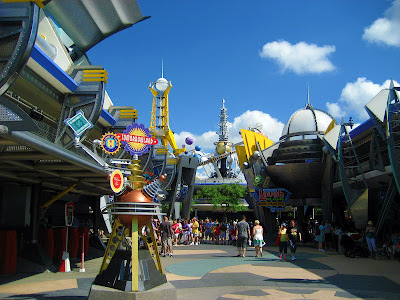 Compared to today's roller-coasters, Space Mountain is fairly simple and not as fast as its more modern counterparts (reaching a speed of only 28.7 mph), but the experience of riding in near-complete darkness to the sound of a zippy musical track, the whoosh of passing asteroids, and the rush of interstellar traffic, has made it a must-ride (and perhaps most popular one in the Magic Kingdom for that matter) for over 35 years. 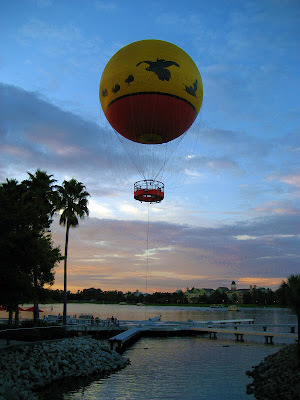 Before heading home, I stopped at Downtown Disney, a waterfront dining/shopping/entertainment district just minutes away from Walt Disney World, where I caught live, outdoor music over a long island iced tea and spicy voodoo shrimp at House of Blues, saw a giant tethered balloon hovering 400 feet above the water, and drank an amazing pineapple mojito while watching a lively salsa band on the waterfront tequila bar of Paradiso 37 as night fell.